I have a couple trips away booked for this year so in my mind I've already started to make a mental list of products and items which I NEED. Depending on how you're travelling and how you like to spend your time travelling this is entirely down to personal choice and comforts. What I haven't added yet are the refreshments, I always need refreshments when travelling. My first must have item is my Kindle, I will be packing this for sure. I'm currently reading Life of Pi but will probably finish this before I venture on my first destination, so if anyone has any recommendations for a good read please comment below! These are my comforting items which I like to indulge in with refreshments on hand of course, this helps the boring travelling time more enjoyable. Onto the products! This is the hardest part, picking the smallest amount of products and trying not to duplicate. 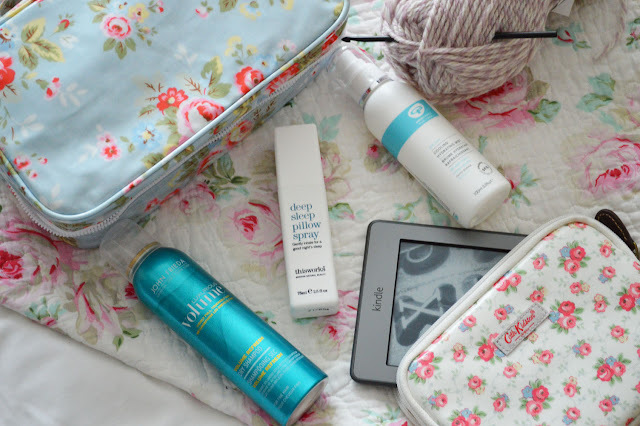 The items I have picked are not extensive, this is what I'll be taking with me for a weekend away. Of course a sun holiday will need sun protection and more body creams/lotions. For cleansers I kept it simple but nice, I'm just getting into 2-phase eye makeup removers. Clinique Take The Day Off is great at removing eye makeup as well as stubborn lipsticks. This handy little travel size bottle came free with their bonus time. So keep a look out for GWP with your favourite brands. I always keep travel sizes in a separate wash bag. That way if you're off on your travels you'll be able to rummage through your stash and pick some items out which wont weigh you down. I wanted to take a cleansing balm with me, when you travel you can feel sluggish and your skin can feel dirty and even dry. 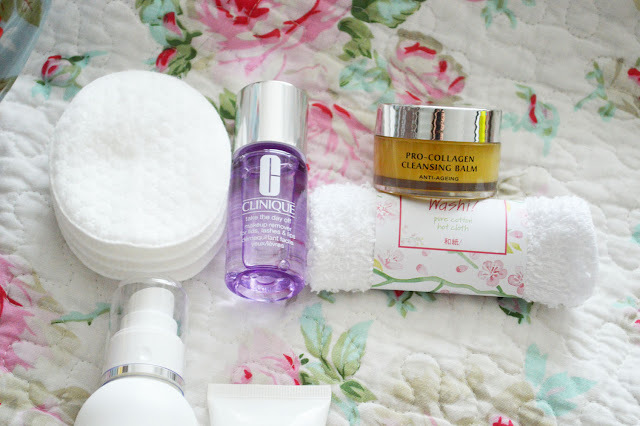 I've been testing out the new Elemis Pro-Collagen Cleansing Balm and it's a winner. I am still yet to try the Emma Hardie version, they both seem very similar after comparing written reviews. The Elemis Pro-Collagen range is fabulous, I've been lucky enough to try a few products from the range and I can highly recommend them. I take a pea-size amount in my palm and melt the balm together, then gently massage all over the face and remove using a Washi Cloth. I bought a pack of these last year and love them, especially for removing facial masks. They look like a flannel but they're softer. A mix between a muslin cloth and a flannel. 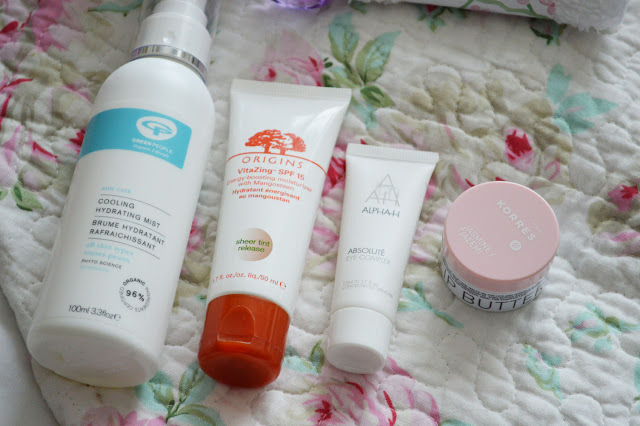 As for day creams I picked something which doubled up as a sunscreen and moisturiser and also a tint of colour. So actually this is a 3-in-1 product and that's the Origins VitaZing SPF15. If you're travelling overnight and you'll be removing makeup and want to look a alive the following morning this is great. Another favourite of mine is ThisWorks Miracle Skin, this works in the same way minus the sunscreen. As for the body I kept it simple, Liz Earle Orange Body Wash smells amazing! It's an uplifting scent which is great for travelling or when you're on the go. To accompany this I also picked the hand wash, depending on where you're travelling and how you're going to get to your final destination I think a mini hand wash/hand sanitiser is great to carry around with you. 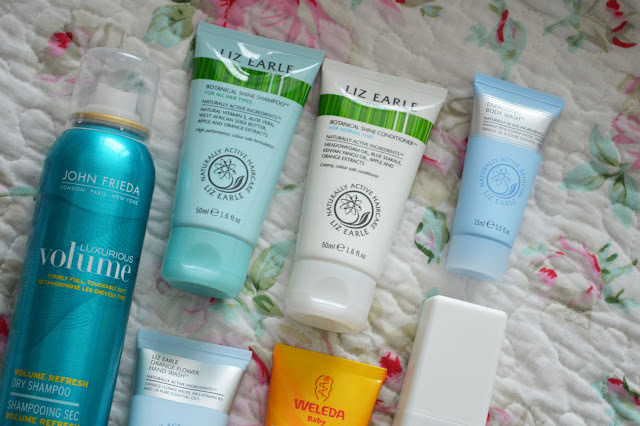 For hair I chose the Liz Earle Botanical Shine Shampoo & Conditioner, these are the perfect for travelling. In Boots and Superdrug they have lots of travel friendly hair care products. If you need to freshen up your hair my favourite dry shampoo is from the new John Frieda range Luxurious Volume. I have reached for this lots since it landed in my hands. It doesn't leave any white powder residue in/on your hair.It smells fresh and is a pleasure to use. 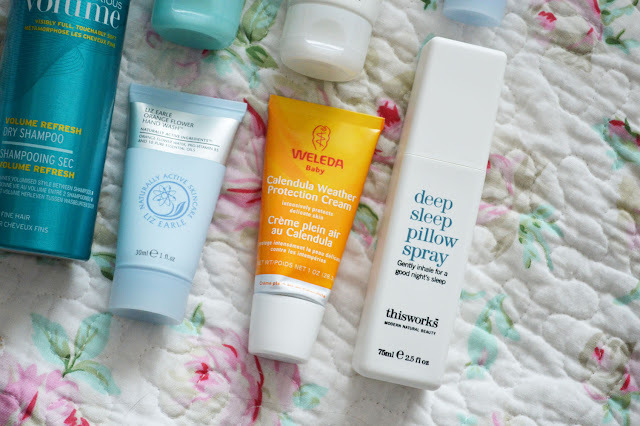 I suffer from terrible dry cracked lips and sadly my 5yr old does to, we've both been testing out the Weleda Calendula Weather Protection Cream. This is like an oily balm and sinks in the skin giving instant relief and comfort whilst adding a protective barrier against the environment. A must have in the colder weather right now! You only need a small amount, it's great to use on ALL the family. The packaging is perfect and fits nicely in a bag, it doubles up as a hand cream but could be a little greasy on the palms so keep it the backs of hands to prevent greasy paws.